North Korea’s smartphone imports from China surged to a record high last year, a sign of a growing number of people there being connected to the net, according to data released Friday. North Korea brought in US$82.8 million worth of smartphones from China in 2014, almost double the amount recorded a year earlier, according to the Seoul-based Korea International Trade Association. It marked the largest volume since 2007, when related data were introduced. Imports of portable data-processing devices, including laptops, also jumped 16 percent on-year to $23 million in 2014 despite a 3-percent decline in the North’s overall imports from China in the year. Around 10 percent of the communist nation’s 24-million residents reportedly use smartphones, with its 3G network run by Koryolink, a joint venture with an Egyptian company, Orascom Telecom. After a promising start seven years ago, two types of digital multimedia broadcasting (DMB) – which enable handheld device owners to watch TV on the road – are facing contrasting destinies. Whereas operators of the free terrestrial DMB, based on over-the-air signals, are enjoying unprecedented prosperity, satellite DMB service – which charged people for programs – is set to shut down at the end of this month amid ever-increasing debts. Satellite DMB is based on videos beamed from a communication satellite. Recent data from the Korea Communications Commission, successor to the Ministry of Information and Communication, show that terrestrial DMB service operators have “almost offset accumulated debt by increased revenue” in the fiscal year of 2011. Though mobile carriers are seeing a rapid rise in long-term evolution (LTE) network subscribers, they are also anxious to earn revenues from what was hitherto considered out of their business areas. 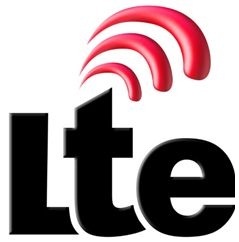 SK Telecom, KT and LG Uplus have shown near same services in telecommunication business recently, all boasting a nationwide LTE network and all releasing voice over LTE (VoLTE, or making voice calls available on an LTE network). Market saturation and the declining profits due to heavy investments on network building are now pushing companies to find a way to increase competitiveness by differentiating themselves from rivals, especially for the second half of this year. SK Telecom, which announced 4 million LTE subscribers Sunday, wants its members to take a keen interest in its growing content. Will rivals wilt in Samsung’s long shadow? Samsung Electronics controls 60 percent of the domestic mobile phone market, a record-high share that may keep growing given the success of its recently released Galaxy S3. This has stoked concern that the company’s quasi-monopoly could squeeze smaller domestic players, causing them to discard unpopular models and shy away from gambling on innovative new releases in a trend that threatens to kill market diversity. “Consumers tend to get used to a company’s mobile user interface, which naturally leads them to keep buying the same company’s products,” said Park Kyung-hoon, a programmer who creates mobile apps. 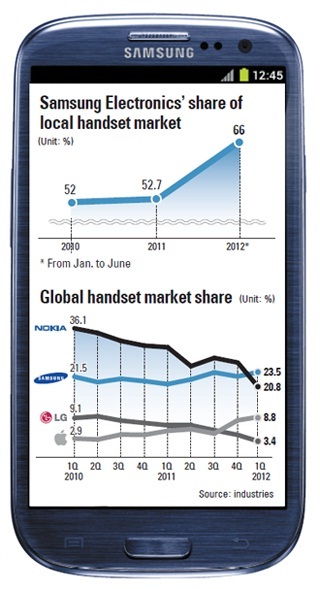 Samsung’s dominance was helped by the fact that LG Electronics was a late entrant into the smartphone industry. It has been striving to redress this by forging ahead with its next-generation long-term evolution (LTE) service, but it is still playing catch-up. Mobile carrier KT announced Tuesday that it will commercialize its voice over long-term evolution (VoLTE) service in October. Current voice calls are all transmitted through third generation (3G) networks but will use LTE networks once the service starts, allowing better quality and faster connectivity, company officials said. KT, though last to establish LTE services among the nation’s three mobile carriers, was the fastest in building a nationwide network. It was completed in March and took a mere four months to complete compared to the year for its rivals. The company is also in an advantageous position with its accumulated knowhow in 3G services such as WiBro to provide uninterrupted connectivity for areas with a poor signal or users on the move. As the No. 1 provider of fixed-line services and 3G prior to the launch of LTE, KT is the most financially stable among its competitors. 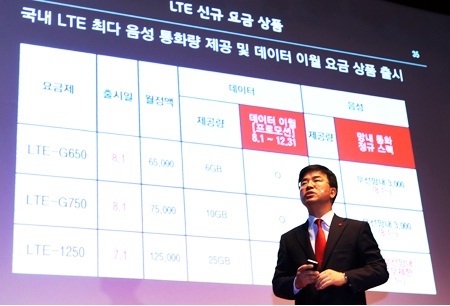 KT currently has 1.4 million LTE subscribers with a goal to secure 2 million by the end of the year. According to officials, the company has already sold 700,000 LTE handsets this month, and considers its target as virtually achieved. South Korea’s fourth generation long-term evolution (LTE) smartphones, first launched in October last year, are expected to outperform their predecessor 3G smartphones in terms of new monthly subscribers only six months since they entered the race. LTE phones sold only 4,000 units in the initial launch in September last year, but made a swift rise to 1.17 million units by October. So far this year, new LTE subscribers have been averaging over 0.7 million each month, sources in the mobile sector disclosed Wednesday. The number of new LTE subscribers reached 746,000 in February, nipping at the heels of 3G subscribers which added up to 781,000. At this rate, new LTE subscribers will exceed 800,000 by March and beat its 3G rivals which are expected to see stale performance in the 700,000 range.